Hello! Today I have something a bit more fun for you. I've recently been talking to the lovely Randi over at Polish My Paws. 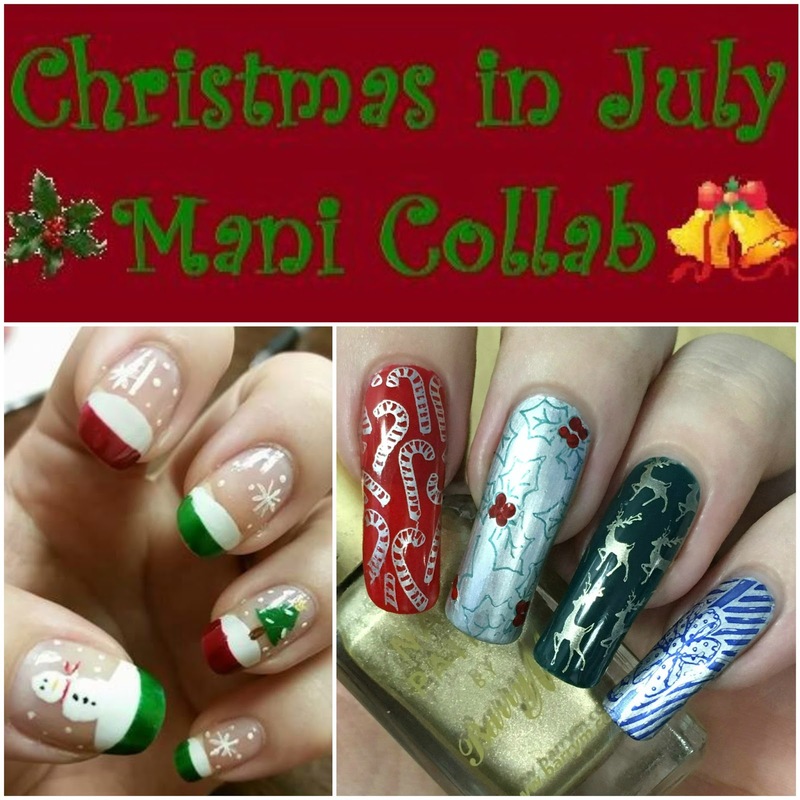 Randi has only just started her blog (here), and was dared to do a 'Christmas In July' theme for her second post. We thought it would be fun to collaborate and do it together. Here's a look at our final designs. 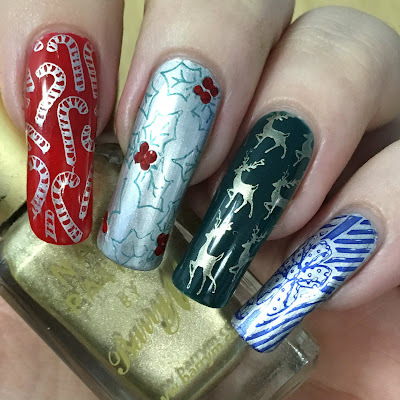 Read on to see how I created my Christmassy contribution! 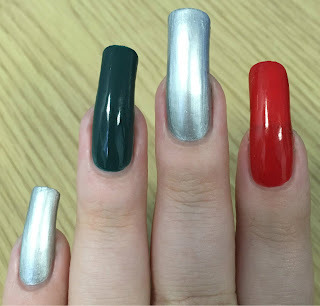 For my base colours, I painted my index finger with Barry M 'Bright Red', ring finger with True Brit London 'Park Lane', and middle and pinky fingers with Barry M 'Silver Foil'. All are shown with two coats (and topcoat) except 'Bright Red' which has three coats. 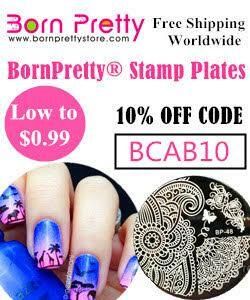 To make the overall process a bit simpler, I decided to stamp all of my nails, and also to use the same stamping plate. I thought it would get a bit too confusing with a mix of decals/vinyls/stamping etc. I chose MoYou London Festive plate 03. On my ring index finger, I stamped the candy cane pattern using Barry M 'Silver Foil'. On my middle finger, I stamped the holly leaves using True Brit London 'Park Lane'. On my ring finger, I stamped the reindeer pattern using Barry M 'Gold Foil'. Finally, on my pinky, I stamped the present using MoYou London 'Metallic Blue'. All stamping was done with my MoYou London XL sticky marshmallow stamper and scraper. As a quick final touch, I used a dotting tool to colour in the holly berries on my pinky with Barry M 'Bright Red'. After a quick clean up, I left all of my nails to dry for a few minutes before topcoating. What do you think? I love it! I have to say I found this collab a bit too exciting. 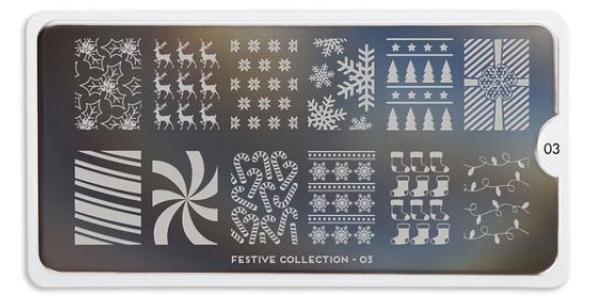 At first it was a bit odd trying to think of a Christmas design in the middle of Summer. But once I got into it, I found it a lot of fun! 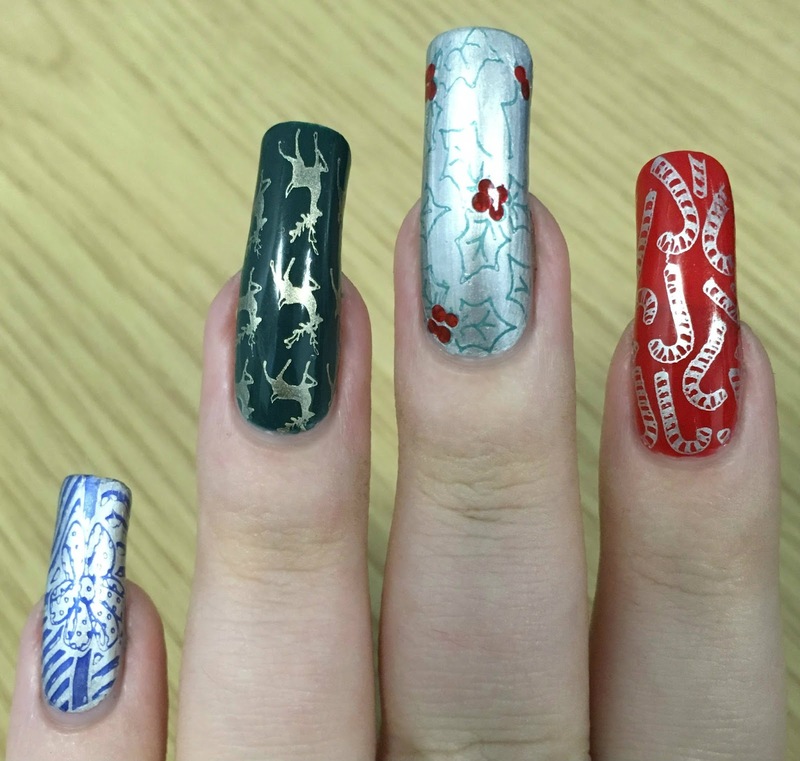 I think my favourite nail has to be the reindeers - I am obsessed with them. I think it would be a great print for a pillow or some bedding! Is it Christmas yet?! Remember to go and check out Randi's amazing design here. I love the stronger colours of the reindeers and candy stripes! Great post Becca! You guys both did a great job! My daughter saw both your nails and instantly started singing Christmas songs lol. Christmas is July is my fave, although I could go far more crazy than doing a design on my nails! I love your stamping designs though & this was amazing. These are such fun! I'm a huge Christmas fan so these really made me excited for Christmas lol!! Although with the lovely weather today it's hard to imagine! I really love the reindeers too! My favourite one are the Candy cane - wouldn't mind having one now! To celebrate Christmas this time in the middle of Winter (South Africa) are a bit weird and way to cold! This looks great! I love the added touch of putting berries with the holly. Woah, I love your take on it!